Whichaway Camp, Antarctica. View across the frozen surface of Lake Whichaway (foreground) towards Whichaway Camp, Queen Maud Land, Antarctica. 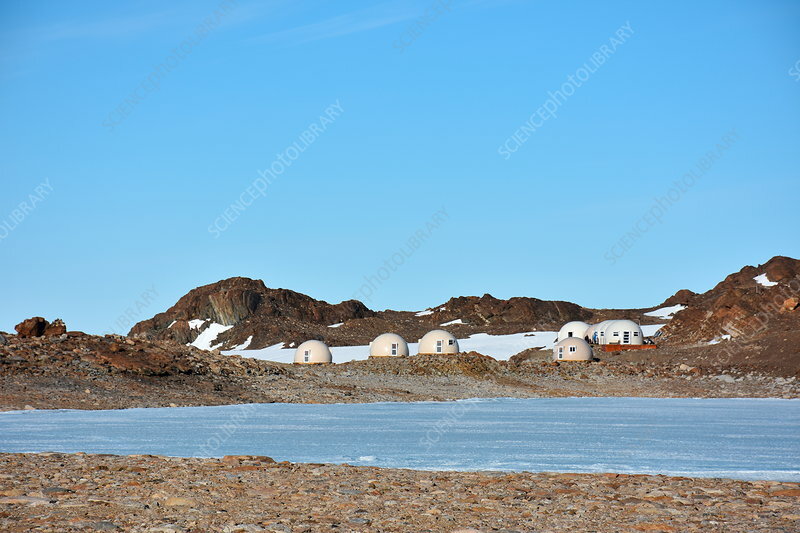 One of the most remote luxury tourist camps on the planet, Whichaway Camp is sited on the rocky Schirmacher Oasis between the Antarctic ice cap and the sea ice off the coast of Princess Astrid Coast. It can accommodate twelve tourists sleeping in six separate sleeping pods, with three large interconnected pods providing communal facilities. Whichaway Camp was retired US astronaut Buzz Aldrin's base for his visit to the South Pole in 2016, during which he became the oldest person to reach the South Pole. Photographed in November 2016.